Angelina Jolie sat down with 25 bloggers to discuss her role in Disney’s Maleficent and opened up and her personal life as well as how she felt about portraying the villain in such an iconic piece. How many people get to say that they’ve had the chance to sit down and interview Angelina Jolie? Ok, I guess if we are talking traditional media… I’d say a lot. But not in the blogger space! I’m not a betting woman, but I have a feeling that I was part of the first group of bloggers to interview this iconic actor. And believe me, I didn’t let the moment pass me by. I had the chance to sit down with Angelina Jolie during the Maleficent press junket and it was magical. As you know, I’ve had the opportunity to do many things with this gig. I’ve shaken hands with many celebrities and experienced a variety of “I never thought that would happen” moments. But interviewing Angelina Jolie will always be a memory that I will never forget. I was NERVOUS. What? Me? I don’t get nervous about meeting anyone!! But for some reason, I was nervous as I sat in our room waiting for our Maleficent press junket to start. Angelina walked into the room as stunning as you’d imagine. A black lace Stella McCartney dress topped off with a pair of KILLER heels… she was exactly how I pictured she would look. Perfect. Oh, this is so fun. 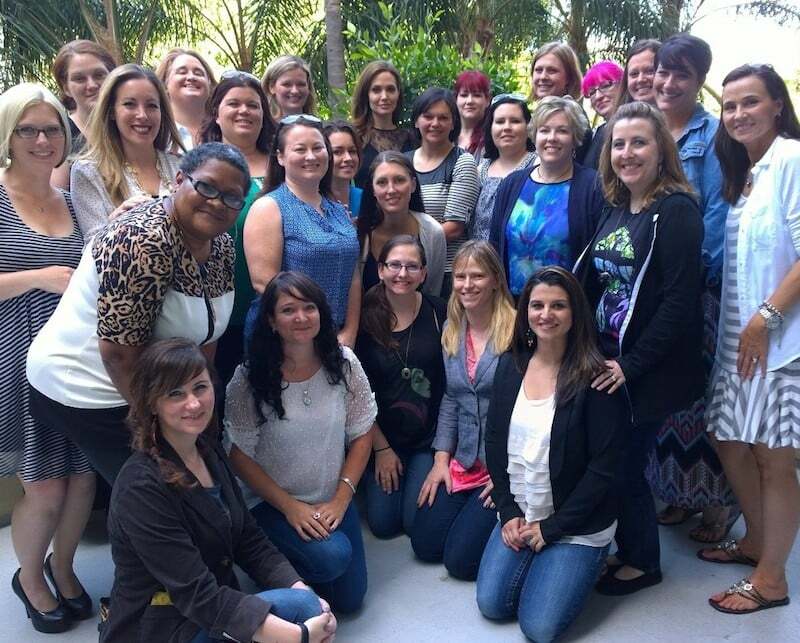 I was so curious what this group of “Mommy Bloggers” was. This is fantastic! Suddenly, all the nerves and anxiety that filled my insides left my body. I was so tense because I didn’t know how the interview would FEEL. I’ve only seen a painted picture of Angelina Jolie – never the real deal. And the real deal felt like a friend. PHEW! She sat down and greeted the group with her token grin. The floor was asked to start with their first question and so we began. Now, as a reminder – we all saw Maleficent the night before. What brought Angelina to the moment where she decided to film a family Disney movie? I was moved by it as a mother. But I was also really moved by it because I thought of myself as a little girl. I thought of all the kids I know. I just think of that notion of feeling different, feeling outside. And also as a woman, feeling abused and this idea that if you’ve ever been abused and then you put this wall up. And you become darker and you’re not able to be this soft person that you were born to be. Then what could possibly ever bring you back? The thing that brings her back is very much the thing that brought me back. And so, I was very, very connected to it. And this was the moment that I started crying. Because there was one scene in the movie where they showed Angelina Jolie’s character waking up and finding herself without her wings. I’m not giving anything away because in the trailer she admits that she once had wings and they were “taken from her”. That one scene was so raw and so full of emotion that I instantly began to weep in the theatre. I cried for Maleficent of course because the scene was about her. But in the end, I was really crying for Angelina because she had to plug into somewhere to get such emotion. I sat in that theatre and hide behind my 3-D glasses and cried for Angelina. It was truly a powerful moment. Even writing this, I am beginning to choke up again. As beautiful as she is, as perfect as Angelina looks in her Maleficent costume, it was the raw emotion that she brought to the role that was the most valuable asset. 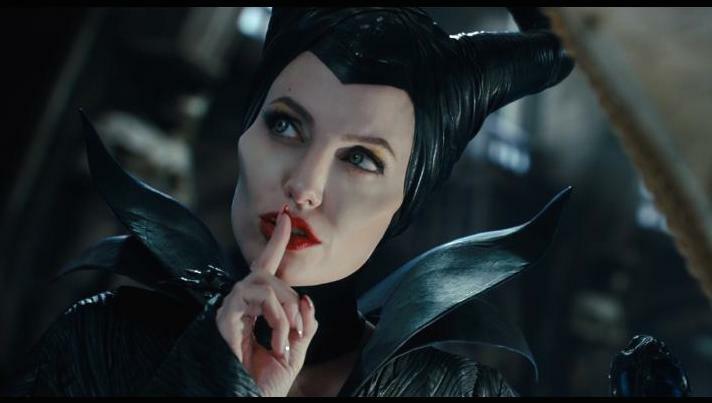 The group was curious to know whether or not Angelina knew a lot about the Maleficent story before reading the script. Turns out Angelina didn’t know much. I didn’t really know anything. When I was a little girl, I was fascinated by her. I didn’t really identify with the princesses, at the time. Princesses thankfully have gotten a little more modern these days. It’s like a little kid seeing Marlene Dietrich for the first time – this elegant, powerful woman who seemed to be having a great time. I was a bit fascinated by her. There was a rumor that the movie was going to be made and I got a call from my brother and he was like, Ang, you’ve got to make a call to Disney. So, I was very happy when I got the call. Just the idea of a Disney movie, having children and just being a big kid myself … was fun. 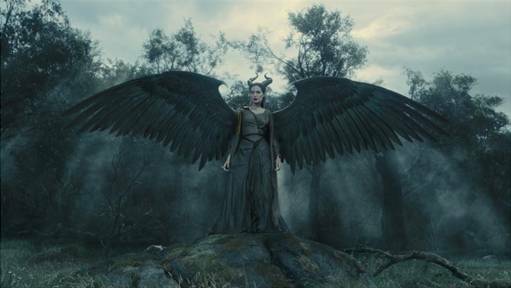 Did Angelina Jolie think it would be possible for Maleficent to resonate with fans? I joked with Linda, I said, how could you possibly make a story where people have any connection to, or empathy for, somebody that curses a baby? It’s just, it’s going to be impossible. I think she did an extraordinary job. I do too!! I’ve mentioned this before but Sleeping Beauty and Maleficent are my favorite Disney stories. Growing up, she was absolutely the scariest evil witch that Disney ever created. So, it was fun to see this other side of her. We all saw how beautiful Angelina Jolie looked as Maleficent. I kept forgetting those eye contacts and cheekbones were fake! They seemed unnaturally natural if that makes sense at all. How long did it take Angelina Jolie to get ready every morning? I think it was about two and a half hours at the end of the day which wasn’t that bad. We had a great team. Tommy and Arjen would work together and do it all at one. It wasn’t too bad. While watching Maleficent walk around on the big screen, I kept thinking about those HORNS. Were they heavy? Did they make her feel unbalanced? How did she get them on her head every morning? The team worked so hard to make the horns not heavy. My hair was in these really funny little-little buns in order to get the head piece on. My hair was used as kind of the thing that held the horns on. They made it very lightweight. Then they also had detachable horns, partially for weight, and also because I kept knocking myself out. If I’d go out the door, because I was about seven and a half foot high, and I’d connect with something. I couldn’t… So the first few days, I was just a complete mess. So they made them that I could snap them. I couldn’t imagine walking around with horns on my head all day long. I would be constantly ramming into things! LOL! 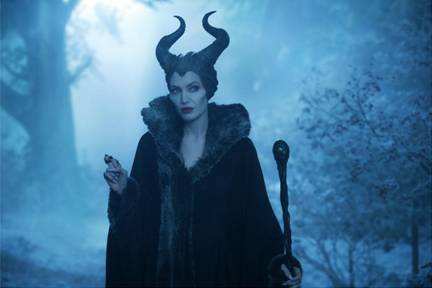 What did Angelina Jolie think the first time she saw herself as Maleficent? I was really happy because we went through a few stages where, in trying to find her, we had a few versions that weren’t so great. There was a period where we thought since she’s got wings then she’s part bird fairy. Maybe she should have feather hair. You know? We went in many different directions. But at the end of the day, we ended up where we did because it is a real film and she has real emotional scenes. There can’t be so much makeup that you’re starring at something pasted with makeup. The soul has to come through. So it had to be enough to look like a creature but still be able to have very serious scenes. So I think they did an amazing job. 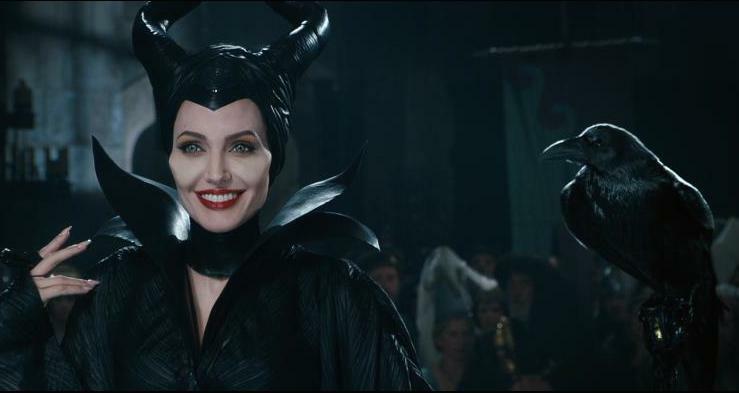 I have to admit – the special effects department did such a great job on Angelina Jolie when making her up as Maleficent that I kept second-guessing the cheeks. In the beginning, I would think that they were fake and then I would think that perhaps it was a play on contouring. Then I would go back to fake. Amazing work. So subtle. So perfect. Slight changes that recreated her look entirely that are so believable that you start to really believe them. How did Angelina decide on the voice she used in the film? My kids helped me find it. I always tell stories, All of us have a few voices. I was giving them baths and I was doing this thing where a few nights in a row I would tell them stories in the bath. And I was trying out voices and a few they’d say, “please stop”. But sometimes, they’d listen and they’d kind of be more engaged. I kept trying and trying and trying. Then I did that voice and they couldn’t stop laughing. And so I kept doing it more, and more. I had to do it the other night for bedtime. Are you ready for my little secret? When I tell stories I use a Scottish accent and my kids get a KICK out of it. I don’t know why I do Scottish??? It’s the craziest thing. Then the tide shifted slightly and someone asked Angelina for advice on how moms can get involved in their own communities and start small. Angelina is known for many things and I think her greatest accomplishments revolve around her humanitarian efforts. Of course, the magazines focus more on what brand sunglasses she wears more times than not. I was so thankful this question was asked because in the end, more people need to hear this message. Well I think the most important thing we do is we raise our children with love and compassion and teach them to become great people and to be thoughtful of others. That’s the most important thing. If everybody did just that, we’d have a very different world. Encourage our children’s education and help them to be conscious of the world around them. I think mothers have the most powerful role. There was even examples of Taliban fighters who stopped because their mothers stopped them. Because the mothers became educated. They couldn’t stop the men. But they educated the mothers and the mothers got them back home.So, mothers are a powerful thing. I think beyond that…there is so much to connect to and there is so much that can be done. You see now with the situation with the Nigerian girls. That’s not government. That’s the masses speaking out pushing for government change. It’s sometimes doesn’t feel like every voice counts, but it really does. There’s a conference in June I’d love you to be aware of that I’m doing with the Foreign Secretary of England on June tenth to the thirteenth which is called PSBI. It’s the largest summit ever to end sexual violence in conflict. It’s in England and is open to the public. Everybody has to come together. NATO will be there, peace keepers will be there, governments will be there, victims and doctors will be there. Everybody together will spend four days. I think that’s what these things take. It takes all of us very tightly working together. What was it like for Angelina Jolie to work with her daughter on Maleficent? In case you don’t know, Vivienne is in the film. She plays a young Aurora for a brief scene. It was a tough choice to do it. I mean, I think everybody knows the reason. I was really scaring other kids in full costume. The movie isn’t frightening for children, but I did scare the girls in person. What four or five year old little girl won’t be scared when I’m saying really mean things like “I don’t like children”? it took us a while to make sure that that was an okay thing to do. The other day, she had to catch the butterfly and she didn’t want to – like any four year old. She just decided she didn’t want to. So there’s some really, really funny outtakes of Brad and I trying to make her.I actually had the stick with the blue ball that’s supposed to be the butterfly and I’m kind of running around in front of her. And Brad’s off the edge of the cliff, kind of trying to dance and make her jump into his arms. And she made us work all for that. The people at Disney did say it was the funniest clips that they’d ever seen. It exists somewhere, I haven’t seen them, I should get them. But it was lovely. It was lovely to do it. I just want to note that she said Brad. That is all. Are there more family-centric movies in Angelina Jolie’s future? Well, Broken is a heavier movie, but we’re aiming for PG-13. I think it’s very important for young people, because there is so much out there that is so aggressive. I wanted to make Broken, because I wanted to do something that I felt was inspiring and that young people would be inspired by. My boys saw it for the first time the other day and I watched them sit through the whole thing and I watched their heads to see if they’d move and they didn’t. They asked me so many interesting questions about faith, and life, and death, and-and war. I think it’s really very important that we talk to our kids about real life issues, and real stories, and real film. Something that makes them walk away from it feeling like there’s a chance, and that the spirit inside of them can rise up against anything and they can feel good about that. No matter how they start, they can rise. That’s the message behind that one. But for Disney characters, we’ll see if I get cast again. I did like my horns, so maybe I’ll get another shot at it. Then the question came up that every woman wanted to know – how does she do it all? Well I don’t. You all know as moms, I’m in a very lucky position. I have a supportive partner and he and I are able to take turns working often. When you make a film, it doesn’t take all year around. When I direct it does, but I get to decide when I leave in the morning and when I come home at night. I can edit in my bedroom. So, I have a very rare luxury with my job to be able to have my kids with me on set every day and home school. Other mothers have it much harder than I do and don’t have the means to have the assistance I do. So, I don’t feel like I, by any means, do anything exceptional. My mom was a single mom and she had a lot of difficulty and she gave up her dreams to make sure she could take me to my auditions and support me. And nobody acknowledged her for what she did. That was hard. But mine? Mine is not too bad at all. I can’t complain. And at this point I was crying again, because I thought about how selfless moms can be and how wonderful Angelina’s mother was to put her life on hold to ensure that her daughter was able to life out her dreams. I guess I was very emotional that day!! What did the kids think when they saw Angelina Jolie for the first time as Maleficent? I should have brought them in early and have them watch me get in my makeup. But I thought it would be really fun to surprise them. Some of them were fine. They just got a little quiet. But Pax ran away from me and I made the mistake of thinking he was playing a game and I chased after him. And then realized he was upset. He had to come in the makeup trailer and watch me take everything off. It was interesting because we wondered about Maleficent. We talked with Disney about why she is considered the most evil. I mean, obviously it’s about what she does. We think it is that she is a woman, and an older woman. A mom. And to my kids it was that a woman should be nurturing. The figure that should be nurturing was now the figure that was slightly terrifying. Personally, for my kids, the “mom” had disappeared and they were really wanting to know where mom went. But I do. I think that’s actually why she’s particularly disturbing for children and why maybe children will embrace her. It’s because it does feel that you should be safe with an older woman. Last question! Has anyone in her family seen the final cut yet?? No, not the finished product. They saw an early cut which had a lot of really bad effects. They were very sweet about it. They’re going to see it for the first time when it’s in 3-D. They did see Vivienne’s scene and the other kids think it’s the funniest thing they’ve ever seen because at home she is my little shadow and I can never get her to like give me space. So, it was very funny that no matter, even at a monster I couldn’t quite get her off. So, they think it’s funny. Ah-MAZING!!!! Like I said, Angelina Jolie was open and warm and honest and completely a dream interview. I cannot tell you enough how thankful I am for the experience. I hope you will go see Maleficent because the retelling is one for the books. * Disney flew me out to LA to interview Angelina Jolie. All flight and hotel accommodations were covered. Really insightful. I was totally wondering about those cheekbones too! And I love thee story of trying to get Vivienne to do her part. I’m not sure if we’ll see the movie. The trailers freak me out and my girls are pretty squeamish, but I am loving the backstory. I love how you were able to get a rare glimpse into Angelina’s behind the scenes process of transforming into her character and how she juggles all the various parts of her life- especially the mom part. This movie looks EXCEPTIONALLY good- we are definitely going to see it! This is so awesome. I would be totally starstruck, too! I have really turned into an Angelina fan when seeing her as a mother. Her family seems so awesome! I am really excited to see this movie. I can’t wait to see this movie! Can’t. Wait. Also, Angelina Jolie is my favorite actress of all time. So, so excited you were able to interview her! This is SO amazing that you got to meet Angelina Jolie!! I can’t wait to see the movie. Great job Vera, loved it! Super cool that you were able to interview Angelina. CanNOT wait for this movie, my girls and I are dying to see it.